The second title in the Storyteller's Series, @lt;I@gt;Ladron de la mente@lt;/I@gt; is a surreal and supernatural story for high-beginning and low-intermediate students, written in simple Spanish for learners of Spanish. Written by respected author Elias Miguel Munoz, this inviting and inexpensive paperback can be used as early as second semester, first-year Spanish. As the story unfolds, students soon learn what happens to a thief who steals something other than property. The essence of the story has not changed since the first edition, yet @lt;I@gt;Ladron de la mente@lt;/I@gt; now features material that is even more readable and thought provoking. Numerous subtle changes were made as well as some major ones. "All-Star" is a four-level, "standards-based" series for adult English learners featuring a picture-dictionary approach to vocabulary building. "Big picture" scenes in each unit provide springboards to a wealth of activities that develop all the language skills. An accessible, step-by-step sequence of lessons in each unit systemically builds language and math skills around life-skill topics. The series presents a family, work, or community application in each unit, and provides two alternate lesson applications in each of the "All Star" Workbooks. This workbook is designed to accompany the beginning level student book. "All-Star" is a four-level, "standards-based" series for adult English learners featuring a picture-dictionary approach to vocabulary building. "Big picture" scenes in each unit provide springboards to a wealth of activities that develop all the language skills. An accessible, step-by-step sequence of lessons in each unit systemically builds language and math skills around life-skill topics. The series presents a family, work, or community application in each unit, and provides two alternate lesson applications in each of the "All Star" Workbooks. This workbook is designed to accompany the high beginning level student book. "All-Star" is a four-level, "standards-based" series for adult English learners featuring a picture-dictionary approach to vocabulary building. "Big picture" scenes in each unit provide springboards to a wealth of activities that develop all the language skills. An accessible, step-by-step sequence of lessons in each unit systemically builds language and math skills around life-skill topics. The series presents a family, work, or community application in each unit, and provides two alternate lesson applications in each of the "All Star" Workbooks. This workbook is designed to accompany the intermediate level student book. Designed to help Advanced Placement students succeed in their studies and achieve a '5' on the AP Exam, AP Achiever for American History provides: An introduction to the American History Advanced Placement Course and Exam, including tips on essay writing for the free-response section of the Exam. A discussion of the AP Themes within the chapter, a chapter summary, as well as practice multiple-choice, free-response and document-based questions with detailed answers in every chapter. Two complete practice exams parallel the AP American History Exam in terms of question type and number of questions. Each practice exam is also similar to the AP Exam with regard to content, style, and format, and it includes thorough explanations for your students. 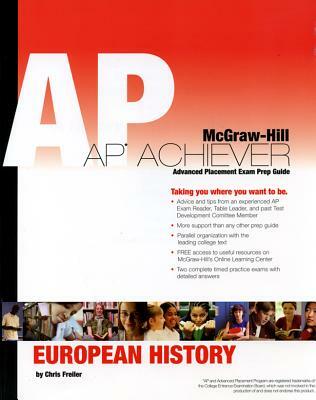 AP Achiever for American History may be used independently or in conjunction with any American history text. For the most benefit use in conjunction with McGraw-Hill's leading text, American History: A Survey, 12th Edition, by Brinkley. Designed to help Advanced Placement students succeed and achieve a '5' on the AP Exam AP Achiever for Chemistry provides: An introduction to the Chemistry Advanced Placement Course and Exam, including tips on essay writing for the free-response portion of the Exam. Concepts, skills, and summaries that reinforce key material. Each chapter also includes "Take Note" sections to guide students through the most important information most likely featured on the AP Exam, as well as practice multiple-choice and essay questions with explanations. Two complete practice exams parallel the AP Chemistry Exam in terms of question type, and number of questions. Each practice exam is also similar to the AP Exam with regard to content, style, and format, and it includes answers and thorough explanations for your students. AP Achiever for Chemistry may be used independently or in conjunction with any Chemistry text. For the most benefit use in conjunction with McGraw-Hill's leading text, Chemistry, 9th Edition, by Chang. Fundamentals of Structural Analysis fourth edition, introduces engineering and architectural students to the basic techniques for analyzing the most common structural elements, including beams, trusses, frames, cables, and arches. The text covers the classical methods of analysis for determinate and indeterminate structures, and provides an introduction to the matrix formulation on which computer analysis is based. This edition features an expanded treatment of snow, earthquake, and wind loads that are part of the updated ANSI/ASCE 7 standards. We've also added Historical Notes to this addition that provide valuable insights to the development of today's techniques and practices. Additionally, about 30% of the text's problems are new or heavily revised. The Student Activities Manual provides complete coordination with the structure and approach of the "Percorsi "textand offers an ample variety of written and listening activities correlated to the topics and grammar components presented in each of the textbook chapters. The traditional workbook exercises provide meaningful practice of the vocabulary and grammar structures introduced in each chapter, as well as practice in reading comprehension and writing skills. The audio exercises are integrated within each chapter and provide listening practice based on authentic speech and real-life situations. The video activities, also integrated within each chapter, complement the activities in the "Guardiamo" section of the textbook. These exercises offer students the ability to expand their understanding of the plot of the video segments while making connections between their own lives and the lives of the characters. The organization of the Student Activities Manual (workbook, lab manual, and video manual) follows that of the main text, providing further practice of each chapter's vocabulary and grammatical structures through sentence building and completion exercises, fill-ins, and art- and realia-cued activities. Reading and writing activities include strategies for improving reading and writing skills. The lab section of each chapter is to be used in conjunction with the SAM audio program recordings of varied listening comprehension selections. The recorded passages are followed by comprehension-check activities. The video manual includes activities that test students' comprehension of the video materials and invite them to react to the experiences and opinions expressed by the speakers. A substantial appendix to both SAMs provides additional targeted practice for Spanish-speaking learners of Portuguese.